The Bike Index would like to introduce BikeBook.io — a service that makes it easy to compare models of bikes between manufacturers and from different years. BikeBook.io is the place to go to find information about the parts and values of bikes. The Bike Index is the best way to save and share information about bikes — but without a way to research what a bike originally came with, there isn't a way to see the cool additions you (or a person you're buying a bike from) has made. We fixed that. Now there's a mobile accessible, simple, powerful (and open source) way to find information about bikes. 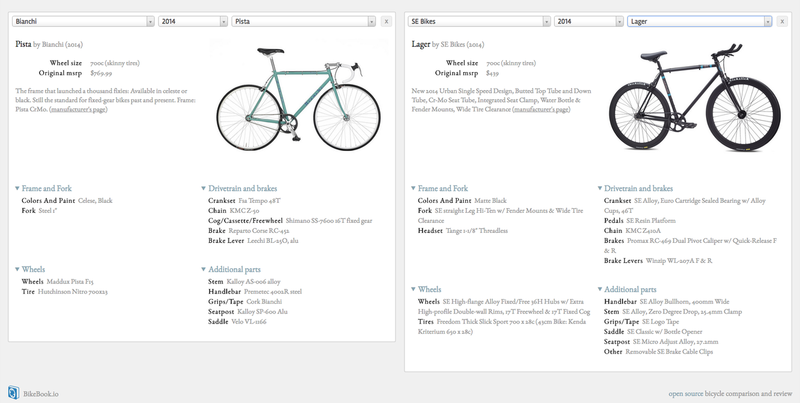 Right now BikeBook.io has 11,000 bikes and frames, and the list continues to grow. BikeBook.io also has an open API, so programmers can access the data through their own services (read how on GitHub). Go forth and compare bikes!